As weather getting cooler, it’s time to cozy up your salads and serve them up warm for extra comfort. I always try to have a meat-free lunch at least three times a week. I spend a little extra time on a Sunday in the kitchen preparing roasting vegetables which can store really well for up 3 days in the fridge and be easily tossed in to a salad for lunch. Try this super simple and colourful salad that is so easy to whip up an satisfy. 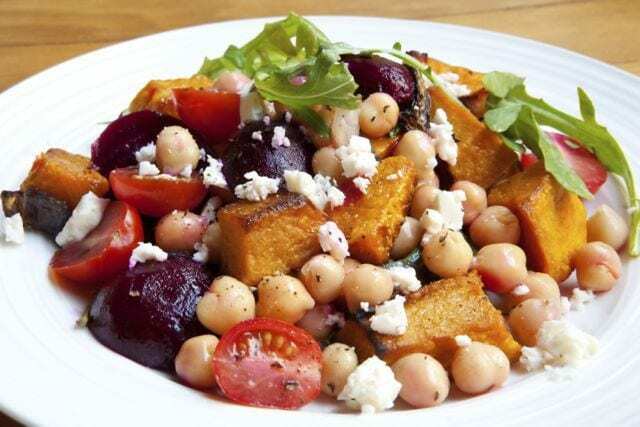 in a large mixing bowl, combine chickpeas, tomatoes, feta, baby beets and pumpkin. For the dressing, squeeze ¼ of fresh lemon and drizzle with olive oil. Mix well. Salt and pepper to taste.